The multi-core, low-power chips are built on Intel's 22nm tri-gate technology and its new "Silvermont" micro-architecture that was announced back in May. The company is launching three new families of Bay Trail chips, the most notable being the Z3000 processors designed for tablet devices. The Z3000 processors will come in both dual and quad core configurations, and according to Intel will clock in with double the CPU and as much as triple the GPU power compared to previous gen Intel Atom processors. The Intel Atom Z3000 will run seamlessly with both Windows 8.1 and Android, on devices with 7 to 11.6 inches and with those in the $199 range. Despite the performance increases, smaller footprint and lower power usage, Intel claims the Z3000 "delivers leading performance with all-day battery life." The company also mentions that it will bring 64-bit support to the Z3000 chips in early 2014, though it doesn't sound like that upgrade will make it into the lower end consumer devices, only enterprise-class and security applications. At this point it is a little unclear when exactly we will start seeing devices with these SoCs. Intel says the chips will be in devices that will be made available to consumers "in the fourth quarter of this year from leading OEMs including," Dell, Asus, Lenovo, Acer and Toshiba. The other two families will build upon Intel's Pentium and Celeron devices. Intel says the new Bay Trail M, which is for lower end notebooks with touch capabilities and "a number of innovative 2 in 1 devices," will bring the cost of those types of devices down to a lower price point. 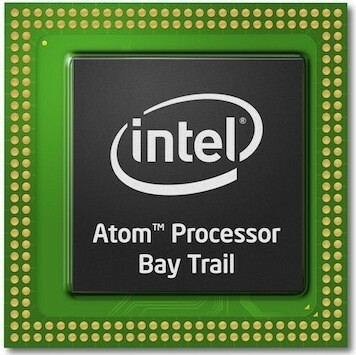 Lastly the Bay Trail D line is for desktops including fan-less devices, vertical displays and will offer "up to 10 times better graphics than similar products from Intel just three years ago."